Liverpool manager Kenny Dalglish has led the tributes to Manchester United manager Sir Alex Ferguson - who celebrates his 25th anniversary in charge at Old Trafford this weekend. Dalglish was player-manager at Liverpool when his fellow Scot replaced Ron Atkinson in November 1986, and returned to Anfield in January with United having become the dominant force in England under Ferguson. Dalglish said: "He has been fantastic for Manchester United and I think he has even surpassed the legend that was Sir Matt Busby with the achievements and success he has had. "To be anywhere for 25 years is unbelievable and every success he has had is testament to him and the football club." United had not won the championship since 1967 before Ferguson took them to Premier League glory in 1993, and the 69-year-old has since added another 11 titles. In all, Ferguson has won 24 major honours with United including two Champions Leagues, but was reported to have been a game away from the sack before Mark Robins scored in an FA Cup win in 1990. "When you remember where the football club was when he came in I think it is a fantastic achievement where he has taken to them now," Dalglish added. "I don't think you would have seen Fergie lasting 25 years when he came in until Mark Robins scored with a header at Nottingham Forest. "But whether anyone does it in the future is irrelevant - no-one can take away the achievement he has had." 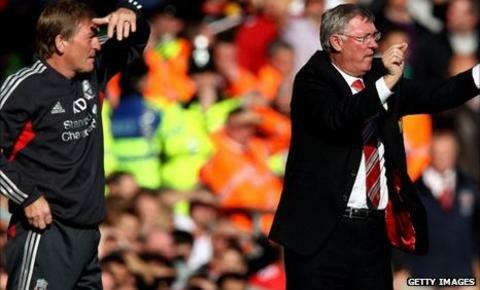 Managers from across the country have been joining Dalglish in praising Ferguson. "I thought that I was going to stay at Porto for 15 years, but eventually we decided it wasn't going to be like that. "An opportunity came around and we took it. "But for any manager, a 25-year spell in one club is fantastic and shows there is tremendous trust in Sir Alex's talent." "To do 25 years? It will never be done again, never, especially at a club like Manchester United, where the huge demands on you are quite incredible. "But he seems to thrive on it. I spoke to him this morning at 7.40am, which is typical of him. "A game last night and he is in the office at 7.40am this morning, which is quite remarkable." "He's been the godfather of this Premier League for a long, long time and still reigns to a degree, although he is being pushed around a little bit by that upstart from down the road, [Manchester City boss Roberto] Mancini. "What he has done is just phenomenal. I was there at the very start because perhaps if Crystal Palace had won the final in 1990 - and we should have if we hadn't made a couple of errors towards the end of the game - he might not even be there, so he's got me to thank for that. "I am pleased for him and long may he continue." "I have to say there's no way he would have the success he has without my mother - there is no doubt about that."